Safe & Sound Vehicle Systems Ltd found their engineers in the Wyke area of Bradford for the installation of a Parrot MKi9200 handsfree car kit. The vehicle for this installation was a 2011 Vauxhall Insignia with the CD400 head unit fitted. The customer had previously owned a Parrot MKi9200 so therefore was familiar with it's easy to use menus and operation of the Parrot Bluetooth Supplied & Fitted in Bradford. The installation saw the Parrot colour screen mounted to the top right hand side of the vehicles centre console as per the picture above. The dual microphone was mounted on the light console in the roof lining, perfectly placed to pick up the drivers voice. On this occasion the customer wanted to dock his music source in the glove box using the Parrot Bluetooth Supplied & Fitted in Bradford. 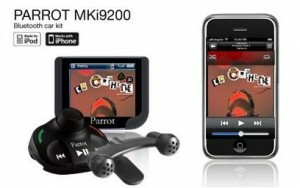 The flexibility of the Parrot MKi9200 offers iPod, USB and 3.5mm audio jack connectivity, and of course not forgetting the SD card slot mounted in the side of the dashboard mounted screen. As with all our Parrot Bluetooth Supplied & Fitted in Bradford, we offer a unique 3 year warranty. This is due to Safe & Sound been registered as Parrot Certified Installers, something not all Parrot suppliers can say. You can verify this for your piece of mind on the Parrot website by clicking here. We provide a mobile installation & fitting service of your Parrot Handsfree Kit throughout Yorkshire including: Wakefield, Pontefract, Castleford, Dewsbury, Leeds, Huddersfield, Bradford, Sheffield, York, Hull, Goole at a location to suit you.